However, Cashin largely won me over. 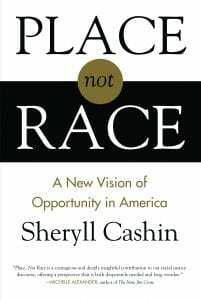 An African-American academic, daughter of integrationists, parent, and longtime student of integration and racial equality, Cashin is a hopeful but by no means simplistic thinker. She is clear that race is still a meaningful factor separate from class when it comes to some subjects—treatment by law enforcement, for example. Her subject, however, is much more narrow: affirmative action for college admissions, especially at elite institutions. Here again, I had some qualms. One of Cashin’s main arguments is that affirmative action, despite its fairly weak status, is a major symbolic contributor to the growing feeling many white Americans have of being wronged. Replacing race-specific policies with ones that will still increase inclusion but are not race-specific would, she argues, be a major step toward being able to build multiracial political coalitions for all sorts of economic justice. While the promise of the power of those coalitions is very tantalizing, I am pretty uncomfortable with the idea of catering to white fragility to the extent of wanting to do away with a policy because it makes people imagine they are persecuted. For better or worse, however, this question may be irrelevant, as Cashin also makes the case that if we follow the trend of legal cases, race-based affirmative action is not long for this world, whether we like it or not. Interestingly, Cashin is really OK with that. Race-based affirmative action was important and appropriate policy when it was first introduced, she argues, but no longer. In the 21st century, she says, campuses are already committed to “optical diversity,” but between highly educated recent African immigrants (who sometimes make up 50 percent of the black students on these campuses) and the African-American middle class, these preferences are being primarily extended to those who don’t need it. Her suggestion is to instead use preferences based on place (not income). The effects of being trapped in a low-opportunity community and school system, and all that goes with it—lowered expectations, fewer challenges, less familiarity with college—are really what an admissions decision-making procedure should be accounting for. Given that poor African-Americans are much more likely to live in an area of concentrated poverty than poor white families, this policy would still have a disproportionate benefit to African-American students, but it would also encompass disadvantaged white students (and others) who have suffered the effects of bad school systems, especially in rural areas. Cashin makes a convincing case. She does not, however, get into much practical detail, and it’s not hard to think of complications. In my own city of Albany, New York, the experiences of a middle-class student who came up through one of the district’s magnet elementaries, and graduated from the competitive International Baccalaureate program at the public high school are worlds away from students from one of the city’s struggling neighborhoods. It wouldn’t seem fair to me to accord the same preference (or lack thereof) to both. And even if you had uniform opportunity within a district, how long would you have had to attend? In fact, the proactive policies of institutions that have already actually committed to socioeconomic inclusion, which Cashin does describe in some detail, are much less automatic than a formal preference. These include things like broadening recruitment outreach to disadvantaged places, expenses-paid trips to campus for prospective students, and downplaying the results of standardized tests—techniques that work, and require a lot of time, commitment, and individual assessment. Perhaps more useful as a policy goal is the recent legislation in Texas that she holds up. Supported by an unusually diverse coalition of interests, it requires the University of Texas to accept all students in the top 10 percent of their graduating high school class, thus effectively balancing out the differences in school systems. Place, Not Race doesn’t have all the answers, but along with higher education admissions officers, for whom it should be required reading, the book will also be important fodder for all those thinking about the intersection of race and class and how to overcome the disadvantages of being raised in certain places.